Laurel Izard has been living and making art in Michigan City for over twenty years. She received her BA from the Northern Illinois University, majoring in art and anthropology, and her MFA in Ceramics from the University of Wisconsin-Madison. After twenty-three years as a self-employed ceramic artist, and teaching art at Marquette Catholic High School, she is currently creating art full-time. Her philosophy as an artist and teacher is that an essential part of being human is to be creative, and continues to teach others how to discover their artistic resources. Her work has been exhibited throughout Northern Indiana and from Coast to Coast in United States. 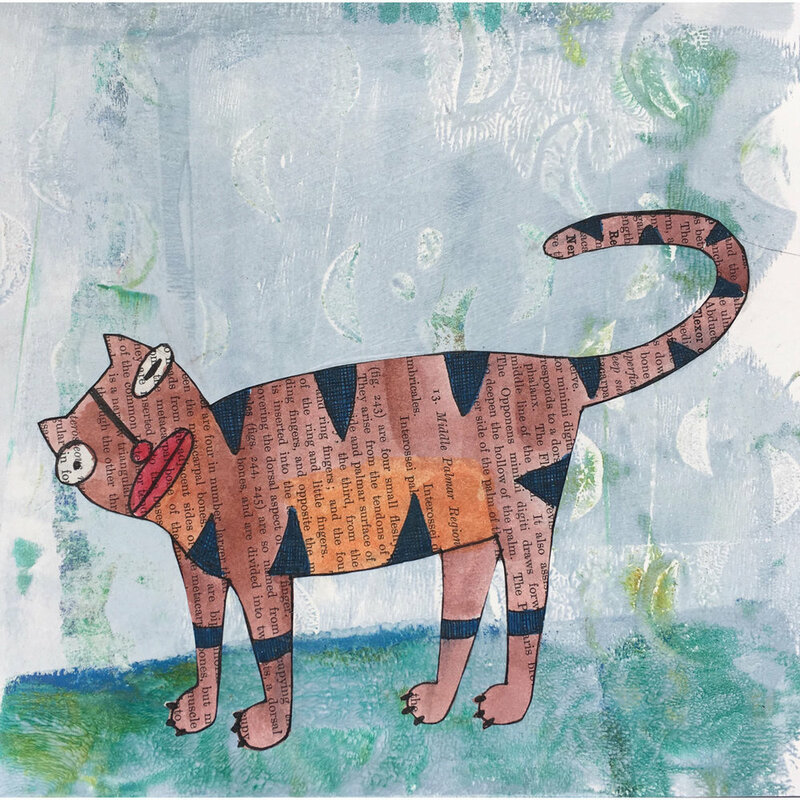 Laurel plans on creating 8” square pen and ink drawings of her cats as alien characters for the CSA Valpo project. The drawings are sketched onto vintage textbook pages and are individually water colored once the lines have been drawn in with ink. Each drawing is then cut out and collaged onto a monotype. 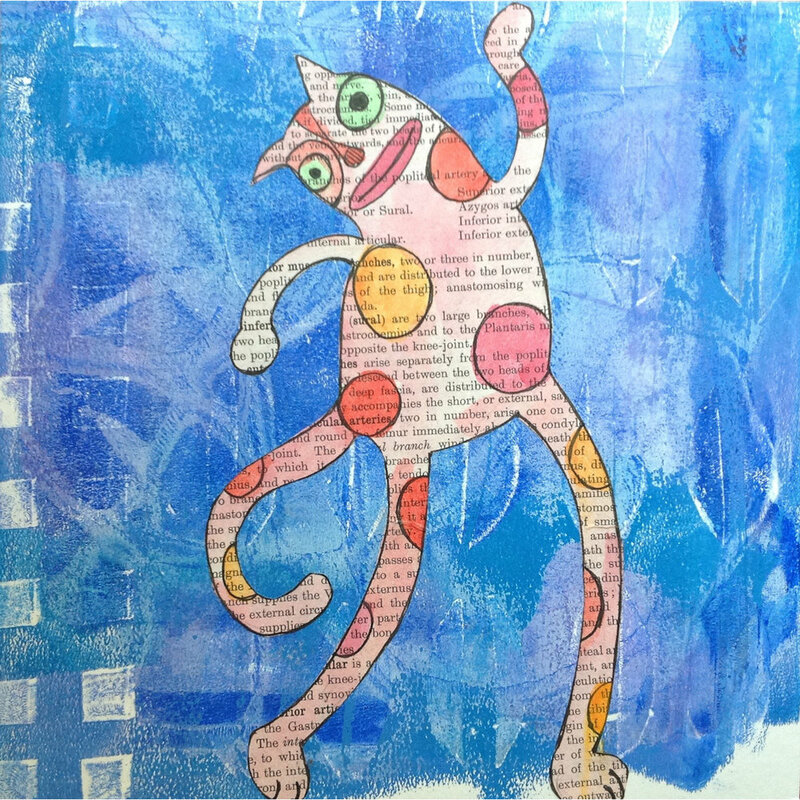 The monotypes are produced using acrylic paint and a gelli printing plate. The aim of the print is to achieve a background that has textures and colors that contrast with the attached drawing. Each collage will be mounted on a 14” x 11” piece of black cardboard that is ready to pop into a frame. The inspiration for these drawings is her imagination, which has been fueled with thousands of images of art from other cultures and time periods, pulp science fiction illustrations, comic books, cartoons, cats, modern art and textile patterns. The characters Laurel comes up with do reflect her love of cats, and her appreciation for their alien and goofy alien personalities.